Love this patio set. Looks nice and is comfortable. Pleased with this set. Bought it about a year ago and it's been outside in Alabama the entire time. The Chairs are very comfortable. Good purchase for a patio or front porch. I love this set! Looks great and appears to be well made. 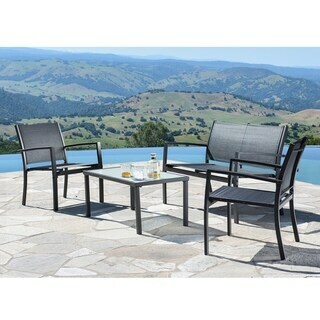 For the price of this outdoor set, it is a good product. Very lightweight so you must be careful on windy days. Great furniture if you don't want to spend a lot or live in a state where you only get to enjoy the outside weather for a few months. This is a nice sturdy patio set. It is actually very comfortable to sit in and the chairs are nicely sized. I also bought the lounger to go with it and it makes a nice set altogether. It is heavy enough to not get blown all over if it is windy. Nicely priced outdoor furniture, comfy without cushions. we found we had a small area that needed a seating arrangement. This works our perfectly. it is light weight but sturdy, no fuss to clean and goes with everything.